When I need some warm, hearty, & comforting food especially on a cold morning, Instant Pot to the rescue!! No more standing by the stove, babysitting the pot of healthy hot breakfast! All oats come from oat groats – the whole, unbroken grains. They’re then processed into different varieties of oats. 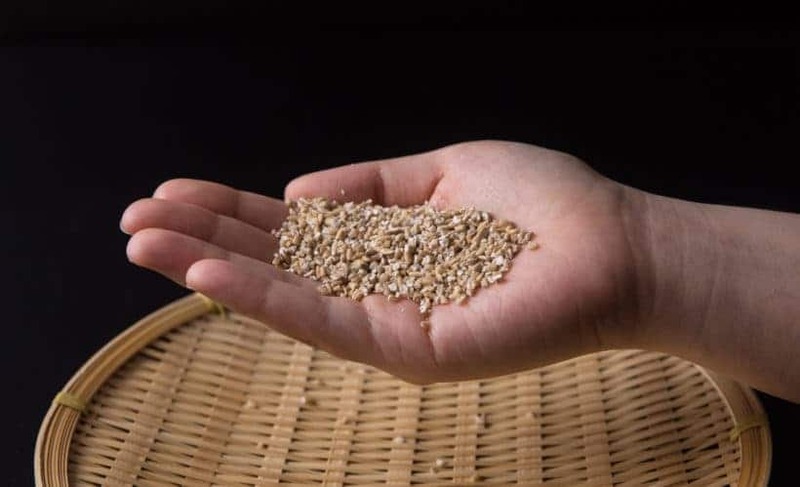 Steel Cut Oats, aka Irish Oats or Coarse Oatmeal, is a type of oats with the least amount of processing compared to Rolled Oats and Instant Oats. They’re just coarsely chopped 2 or 3 times, and neither steamed nor rolled. 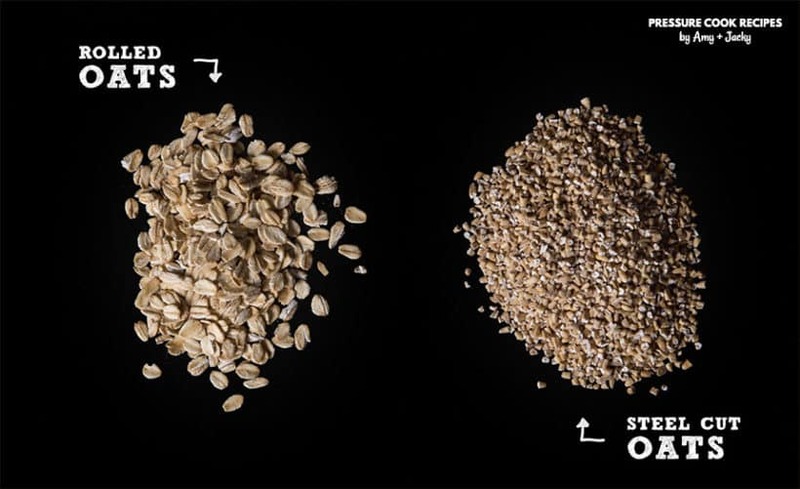 The main difference between Steel Cut Oats, Rolled Oats, and Instant Oats is how much the original oat groat has been processed. After processing, each variety has their distinct texture and varies in cooking times. Are Steel Cut Oats Healthier than Other Oats? Though Steel Cut Oats are the least processed, the differences in nutrition are very minor. For example, Steel Cut Oats is a bit lower in calories than Rolled Oats, but equal in protein, identical carbohydrate count, similar fiber, hardly any sugar (slightly less sugar than Rolled Oats). Then, Why Eat Steel Cut Oats? The key difference is Steel Cut Oats is lower on Glycemic Index (a measurement of the rise in blood sugar) than other oats varieties. Since Steel Cut Oats has less surface area than other oats, it slows digestion and causes the stomach to work longer to break down the grain. What we look for in Perfect Instant Pot Steel Cut Oats? 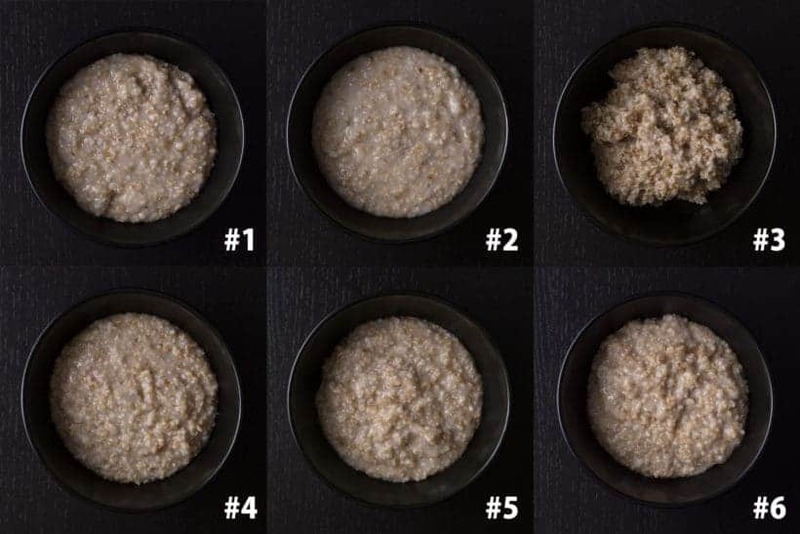 We conducted 6+ tests with Steel Cut Oats using different amounts of water:oats ratio, and cooking time in our Instant Pot Electric Pressure Cooker. 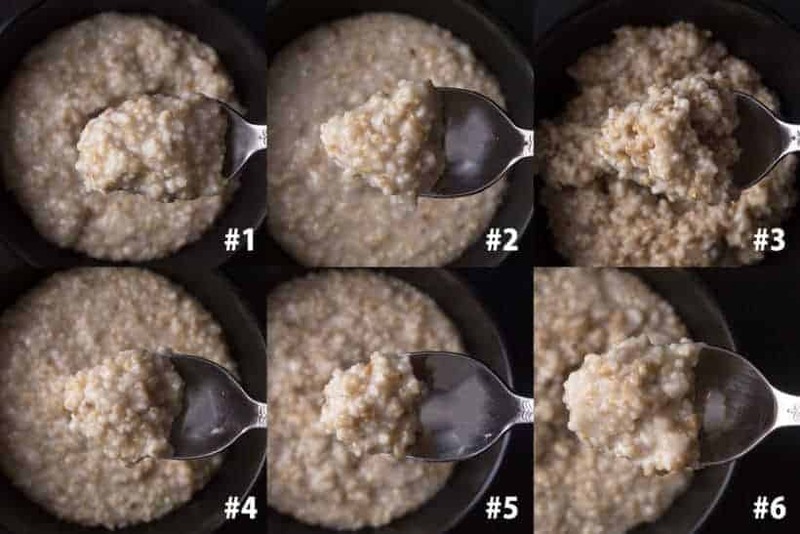 We enjoy Steel Cut Oats that are al dente with creamy & thick consistency, so our desired Instant Pot Steel Cut Oats Method is Test #4. Slightly more moist: follow the method of Test #1. Quite soft & really creamy: follow the method of Test #6. Which texture & consistency do you prefer? ? If you want hot steel cut oats ready when you wake up: Pour everything in the night before and set the delay timer to roughly 30 minutes before you wake up the next morning. How to Set the Delay Timer on Instant Pot? *Note: We have set it to start cooking in 8 hours in the above picture. Add 80g (½ cup) steel cut oats in the pressure cooker. 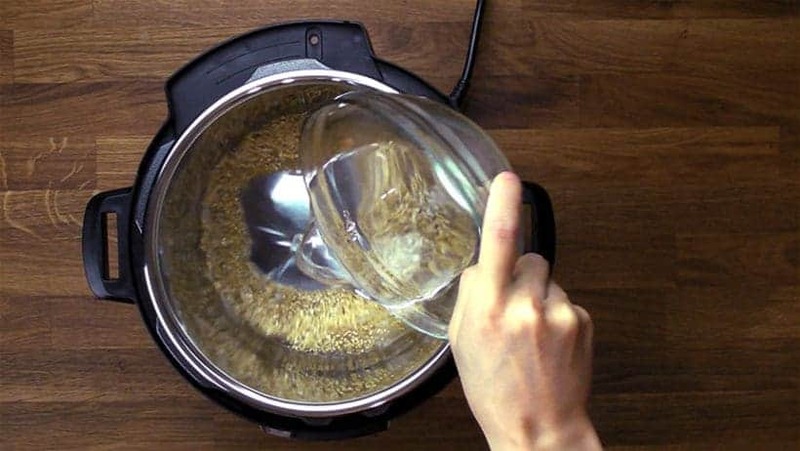 Pour in 313 ml (1 ¼ cup) – 375 ml (1 ½ cup) cold water and make sure all the steel cut oats are submerged in the water. The steel cut oats will look watery when you first open the lid (as shown in photo below). Don’t panic! It’s normal. Give it a few quick stir with a silicone spatula to combine and thicken the steel cut oats. As a reference, eating ¼ cup (20g) of steel cut oats per person without any additional toppings for breakfast can keep us full for roughly 3 hours. 2. Can I Double the Recipe? Yes! 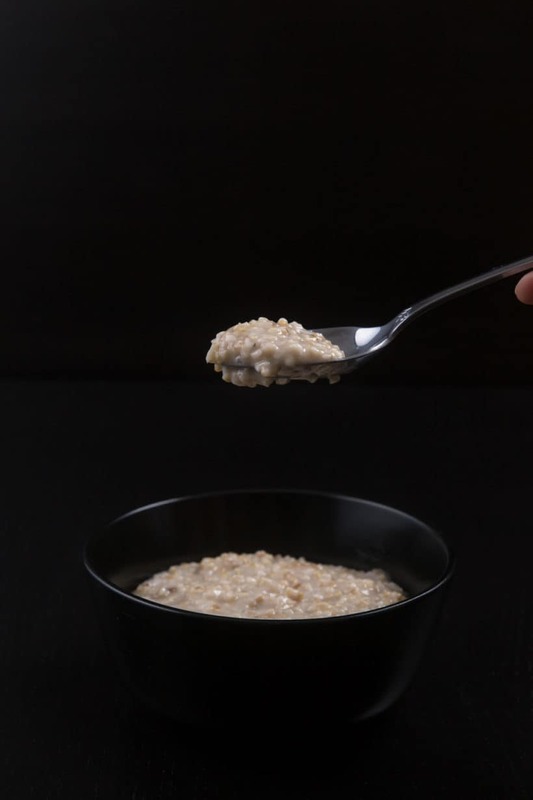 You can double or triple this Instant Pot Steel Cut Oats Recipe by using the same Oats:Water Ratio without changing the cooking time. 3. What is the Maximum Amount of Steel Cut Oats I Can Make in the Instant Pot? 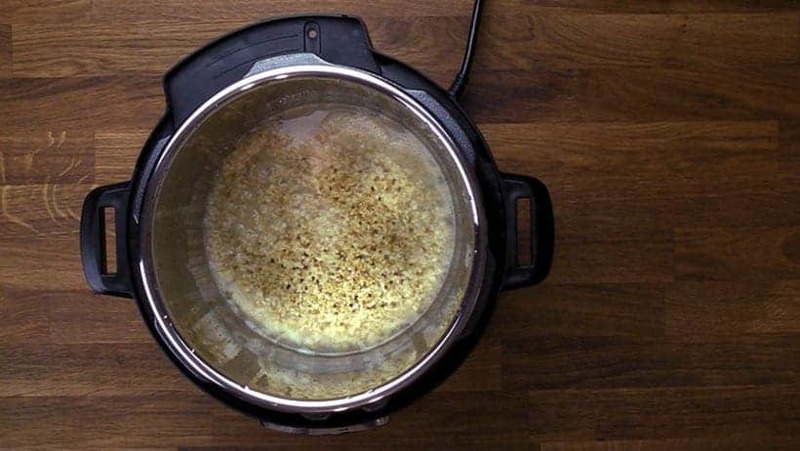 Do not fill your pressure cooker more than half way full with steel cut oats, as it is a foamy food. 4. I Want Creamier Steel Cut Oats! The longer you cook the Steel Cut Oats, the creamier it will get, but the trade-off is you’ll lose some of the chewiness texture. Cook this Healthy & Creamy Instant Pot Steel Cut Oats Recipe (Pressure Cooker Steel Cut Oats) in 30 mins. Make-ahead or set it overnight. 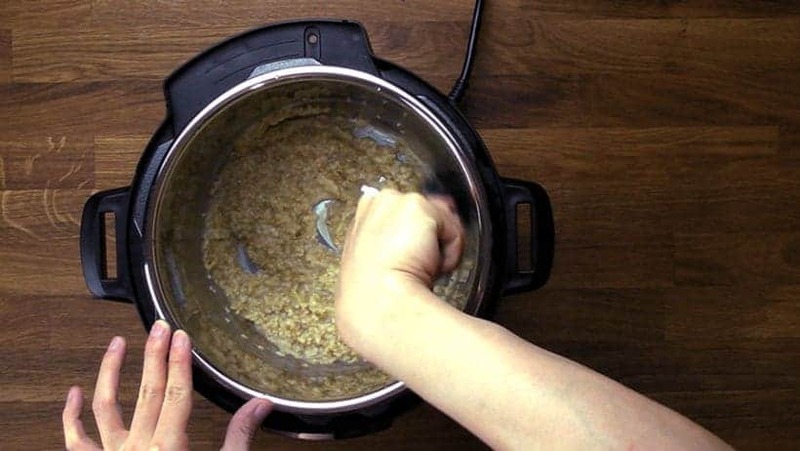 Make perfect oatmeal without babysitting the pot! *Overnight Option - Hot and Ready Overnight Steel Cut Oats: Pour everything in the night before and set the delay timer to roughly 30 minutes before you wake up the next morning. See above for instructions on how to set the delay timer. Pressure Cook Steel Cut Oats: Add 80g (½ cup) steel cut oats in the pressure cooker. 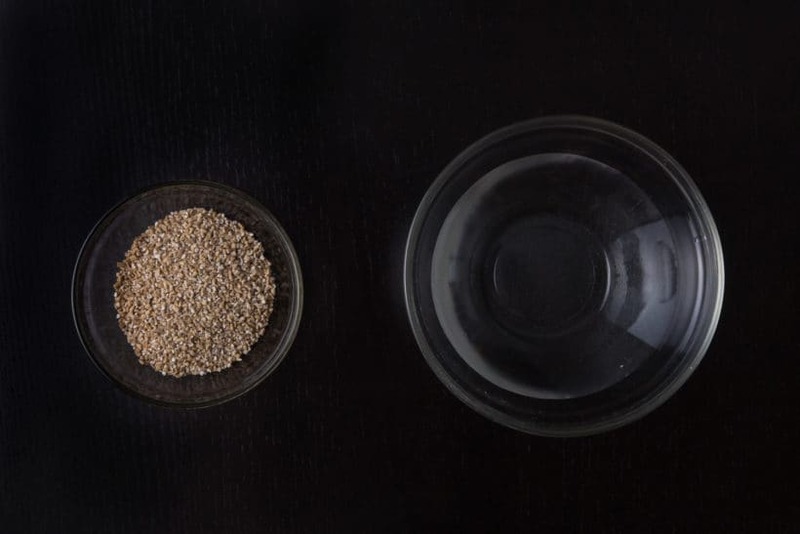 Pour in 313ml (1¼ cup) to 375ml (1 ½ cup) cold water and make sure all the steel cut oats are submerged in the water. Close lid and cook at High Pressure for 10 minutes, then Full Natural Release (~12 minutes). Open the lid carefully. Thicken Steel Cut Oats: The steel cut oats will look watery when you first open the lid. Give it a few quick stir with a silicone spatula to combine and thicken the steel cut oats. 1. Serving Portion: ¼ cup (20g) of steel cut oats per person without any additional toppings for breakfast can keep us full for roughly 3 hours. 2. Double the Recipe: You can double or triple the recipe by using the same Oats:Water Ratio without changing the cooking time. 3. Maximum Amount of Steel Cut Oats: Do not fill your pressure cooker more than half way full with steel cut oats, as it is a foamy food. 4. Creamier Steel Cut Oats: The longer you cook the Steel Cut Oats, the creamier it will get, but you'll lose some of the chewiness texture. Love the experimenting and a chance to see what results you got! Thank you for sharing. I opted to mix up and aim for something between #4 and #6–I tried 15 min. Sweet perfection for my crew! I did #4 and added frozen blueberries and chia seeds and it came out perfect! Thank you! I’m new to instant pot. Just tried this. Easy and Turned out delicious. I really liked the texture. Don’t think I’ll go back to quick oats ever again! Thanks for recipe and wonderful website. The timing and proportions are just right for tasty oatmeal with the right amount of “bite”. Easy to double recipe and have breakfast made for the rest of the week! I tried your steel cut oats, half a cup oats and 1 and 1/2 cups of water with a delay cook, the oatmeal came out great but a lot of it stick to the bottom any suggestions to help with that? Thank you for your kind words & question. I recommend adding a bit more liquid if the oatmeal are being left in the keep warm mode for a longer period of time. I’m using Bob’s Red Mill quick cooking steel cut oats so I reduced the cooking time to 7 mins and its perfect every time! I wish I would have known just how easy and mess free cooking in this instapot was, especially for things like oats. I would have bought one the first day they came out! I love it and all of your hard work and good recipes! Your 17th cheesecake was a huge hit this Christmas and converted some people who thought they hated cheese cake to lovers of cheese cake! Thank you so much Amy & Jack, because of you I love cooking again! So happy to hear your cooking story. Thank you so much for your kind words and support! Combine in pot so that oats are submerged. Creamy with a bit of chew. Thank you so much for sharing your cooking experience with us. Does this recipe do well if you want to divide the finished oats into individual containers for reheating throughout the week? Thank you for your question. It will work fine. Thank you for doing all the test-and-learn work on this! I am using the No. 4 ratio (1/2 cup oats to 1 1/4 cup water) and it is giving us perfect steel cut oats — just like you said! Al dente, perfectly chewy, perfect consistency; not too creamy, watery and not too dry. Thank you so much! I realized since my last post, I was mistakenly using 3 minute quick steel cut oats! Ooooops! Regular Steel Cut works just exactly as described in your recipe! Sorry I messed up! Toasting the groats or steel-cut oats before cooking adds a further dimension of complexity to their taste. I made oatmeal for the first time today. I did method 6 with the recipe doubled so 1 cup steel cut oats and 2-1/2 cups water. Pressure cooked on high for 20 minutes and did natural release. Hubby thought it was too chewy. Suggestions for next time please. Steel cut oats will be somewhat chewy unless you cook it for a longer period. You will want to add a few more minutes to the pressure cooking time. Perfection! So yummy! After the cooking process, I divided into 2 servings. To one of the servings, I added 1/2 cup blueberries + 2 tbsp maple syrup + 2 tbsp sliced almonds. And the best part …. I have breakfast for tomorrow already ready and waiting. I will try your delay timer instructions soon too. Thank you so much for your wonderful recipes, tips and techniques. I got my IP as a birthday present a few days ago and tried this recipe today. I adjusted my cooking time because of our high altitude (7800) and it came out perfect. I made it for 3 servings and probably had about a serving left over, which promptly went in my fridge. I look forward to looking/using more of your recipes! Thank you for your kind words and so happy to have you on our site! 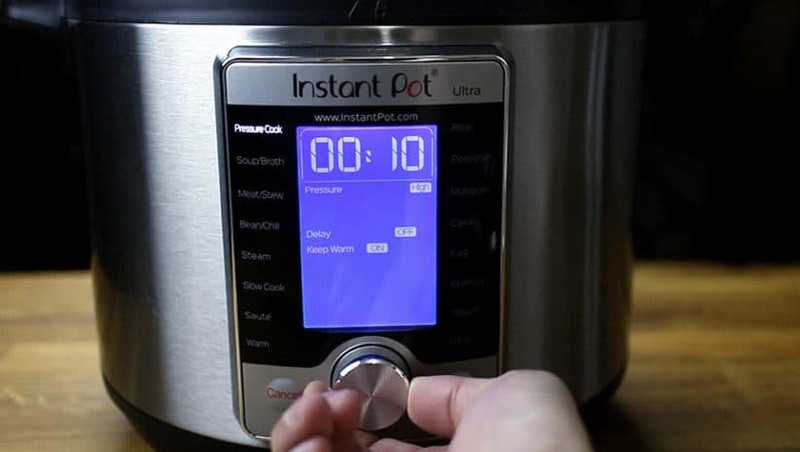 I am new to Instant :Pot. I see when you want to cook the steel cut oats with milk you need to use the Pot in Pot method. When I searched pot in pot it always referred to cooking two dishes at the same time. When cooking the oats with milk do you let the bottom under the rack stay dry and put all of the liquid in the top pan? I was unsure of heating the IP with the bottom dry. Thanks for clearing this up for me. You will need one cup of water at the bottom. Thanks so much for the tests! I tried making steel cut oats the way suggested by the cookbook (p. 32) included with the Instant Pot: 1 cup oats to 1.66 cups water for 10 minutes cook time on the multigrain setting (guessing that is still high pressure? ), full natural release. Which, reading your test parameters is very close to your Test #3. The oats were just starting to stick to the bottom of the pot but were tasty, if very dry. I then went looking for alternative recipes which called for cooking times of 3 to 15 minute so I was very glad to find this page. Thanks for your kind words! 🙂 So glad you found us too! I do have a question. While waiting for the natural release, is the pot set to warm or is it off? Also, I have the 8 quart model – do I need to make any changes to the recipe? Both methods will work for the Instant Pot as the keep warm function will not kick in well after natural release. I would increase this recipe by 1.5x in the 8 quart model. Thanks for taking the time to give us all these options. You guys are seriously amazing! We won’t be able to do it without you guys!! Thank you for your kind words Sue. December 25, 2018 Sue D.
Sue, you added cooked oatmeal to cooked broth instead of cooking the oats in broth? It works? Hi! Do you think it’s alright if I add some frozen fruit to it while it cooks? I have some frozen cherries and I’d love for them to be all hot and juicy along with the oatmeal. Thanks for the recipe! Yes, you can add in some frozen cherries. You can also add it after pressure cooking to warm them up as well. HI! I’m going to try making this today or tomorrow…I have a ton of frozen blueberries I may lookingvto use up. Can I add these to the mix or no? Oops–Sorry, nevermind! I don’t know why I didn’t see it sooner, but I found the serving size. My apologies. One thing I was looking for, though, is yield/servings for your recipe. There are nine of us in our family and was trying to figure out how much to scale up to serve breakfast. Glad you figured out the serving size. It is a little difficult to spot as there are a lot of words. Do you know which setting I would use on a Farberware 7 in 1 pressure cooker? How do I get it on a high pressure setting? Thank you! I doubled the recipe (1c steel cut oats, 2.5c water) & the message “burn” appeared & a warning beep sounded. An online search showed that this means it won’t reach full pressure because there isn’t enough liquid. What do you recommend? Did you purchase the Instant Pot recently? We haven’t confirmed with the Instant Pot company yet, but some of our readers have reported the latest batch of Instant Pot have been very sensitive with the burn message. I would recommend adding about an extra 1/4 – 1/2 cup of cold water and try again. I bought an Instant Pot Ultra and am beginning to regret it as the recipe and cooking instructions are next to nonexistent in the materials sent and on the Internet. I bought it so I wouldn’t have to use manual setting all the time. For example, I want to cook oatmeal using the porridge button, but can’t find any information about that. What good are all the buttons if the company doesn’t give you any information on how to use them? Do you dear folks know of any source for the information I seek? Do you know if the porridge button will make oatmeal? Your site and recipes are great and so are you! Thank you for your kind words. I would try the Porridge Less function. Don’t give up as we will always be here to help! I am a new Instant Pot user. Thank you so much for this very detailed recipe. I really appreciate the various options. I made it the other day and this very second. I use #4 and it really is perfect! Thank you! Putting apples in will make them mushy. It is best to separate them into 2 portions. One portion to cook with the oatmeal and another to garnish for texture. Wow, thank you for writing such a comprehensive guide! I am curious though, if the “quick cooking” steel cut oats would work in the instant pot? I’ve been scouring the internet for a reliable recipe and am coming up short. We haven’t tried the quick cooking version, but a few readers told us it will only take 2 – 3 minutes and natural release for 10 minutes. Just wanted to inform you of an error in the section: Then, Why Eat Steel Cut Oats? The rolled oats have more surface area, which translates to more area for digestive fluids to work. Thereby, allowing your body to digest the rolled oats at a faster rate. Thank you for letting us know Charlie!! I made the recipe as you stated but made the following changes and it did not turn out the way I thought it would. What happened? Thank you for purchasing an Instant Pot, we are sorry that This did not turn out the way you wanted. Thank you for writing. Read the bloody instructions again, follow them exactly and try the result. If you want butter, cinnamon or ground cedar trees in your porridge try adding them to the finished product. I just wanted you to know that I see what you do and I really respect your professionalism. I would like a recipe for a healthier jook using steel cut oats. How could other jook ingredients be incorporated? (I’ve never made jook. I assume I could check out ingredients from non-Instant Pot recipes. 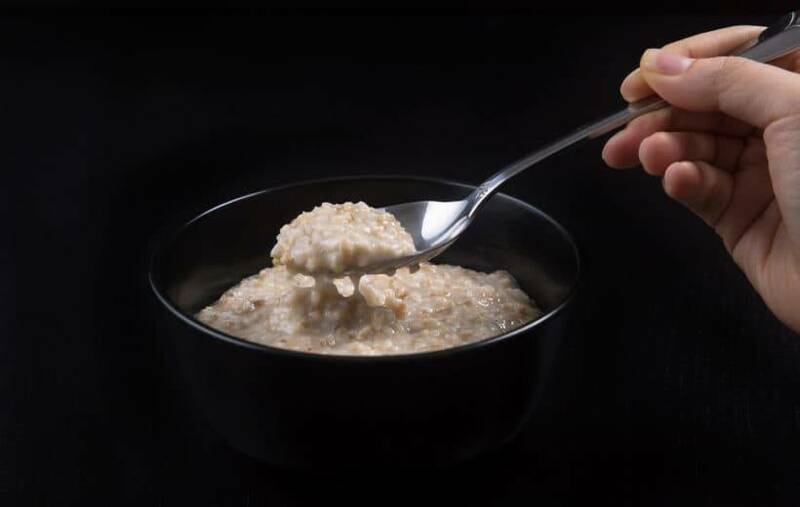 You will probably want about 1/4 – 1/2 cup of water more as jook is not as thick as steel cut oats. Chicken & other meat will also release some juice too so keep that in mind. We used water as the only liquid in this recipe. For milk, it is better to use the pot in pot method. I got my Instant Pot yesterday and found your site this morning. My husband loves steel cut oats and I made perfect steel cut oats this morning! Many thanks, you have a new follower! Let us know if you come across any questions and we will see you around! I just got an instant pot and wanted to make oatmeal. I looked at several pages, but liked how you laid it out. I decided to go with an amount between #1 and #4. I used about 1 1/3 cups of liquid (1 cup soy and 1/3 cup water). I did the 10 minutes on high pressure with NR. The oatmeal was drier than #3 and was stuck and close to burned on the bottom. 🙁 I added a little liquid at a time, probably about 1/2 cup total more just to get it less dry. When I cook it on the stove, I always do 2 cups liquid for 1/2 cup oats, which turns out perfectly for me. Any idea why mine was so dry? Should there be less liquid when cooking in the pressure cooker than on the stove? Cooking in a pressure cooker will require less liquid than on stovetop as there is no evaporation taking place. Is the oatmeal you are using Steel cut oats as other oats will absorb more liquid when cooking. Another possibility: Soy milk can scorch the bottom when it is heat to high temperature so it is best to use the pot in pot method for soy milk + water combo (You will have to increase the cooking time by a few minutes). Thanks for the info. So Soy milk won’t work well, but almond milk will? I can use that, I typically switch back and forth. Yes, I am using Steel cut oats. Any ideas on why it was so dry? It could be the soy milk scorching the bottom a little bit and causing the Instant Pot to get up to pressure slower (Evaporation happens when steam can escape the pot). Or it could be the steel cut oats you are using are more absorbent than usual (That will be a easy fix as well. Just add a little more liquid initially). Let us know how the second batch goes! I used 1 cup of steel cut oats and 3 cups 2% milk instead of water on HP. I added a pinch of salt, some cinnamon, and vanilla extract. But my instant pot said ‘burn’ before t ever started to cook. Is it because of the milk or extra ingredients? Milk will scorch the bottom of the pan as it gets hot so it is not recommended to use milk directly in the innerpot. I would use the pot in pot method if you would like to use milk instead of water. Take care & have a great weekend 🙂 !! I once had the most memorable bowl of steel cut oats in a little town in Ireland whose name I cannot spell let alone pronounce. They were super creamy with only the slightest bite to them. After many attempts I have gotten the texture now all I have to perfect is the butter and sugar seasoning. PIP 1 cup in IP, 1:4.5 cups sco:water, IP for TWENTY THREE minutes, NPR 15-20 min. Apologize for the delay in response as we were on the road. We will have to try your method next time! I have an 8 quart IP. I doubled the recipe. First time I used 1C oats, 2.5C water. Second time 1C oats 3C water. Both times I got burn notice about 2 minutes after “cook” started. I shut it off and did a QR in case of burn problems and each time there was some stuck to pot bottom, but not really burned on. The oats however were pretty well cooked and tasty. Kinda like picture “6” in your tests! Happy to hear the pot in pot method work for you!! How do I do this using oat groats instead of steel cut oats? Oat groats will take longer. I would recommend trying 16 – 18 minutes + Natural release. I made steel cut oats in my Instant Pot for the first time this last Sunday. Taking a cue from another reviewer, I browned the oats in a 1/2 Tbsp of butter for 2 minutes. Then I added 3/4 cup of almond milk and 3/4 cup of water, a small pinch of salt and a small splash of vanilla. Cooked 10 minutes at high pressure followed by full natural release. Result was perfectly creamy oatmeal with perfect tooth; topped it with sliced banana and coarse chopped almonds. Yummy! Just got our Instant Pot about a week ago and have loved everything we have made from your site. With regards to the overnight delayed start for steel cut oats, should the time be reduced since the oats will be soaking all night? Do you notice much difference in texture with delayed start vs. doing everything in the morning? This would make a great workday breakfast. Thanks! The texture will be slightly softer (not too much) since the oats have been soaked overnight. Can I use almond milk in place of water? Take care & have an awesome weekend! I have been using this same ratio for 2 years, doubled. The only changes I make are to add about a tablespoon of butter and brown the steel cut oats about 1 1/2 to 2 minutes prior to cooking develop. The develop a great butterscotch aroma. Then I add the water and about 1/4 cup (for the doubled recipe) of instant milk that has been stirred into the water and cook as mentioned. I noticed that the ‘cook time’ on the printed recipe card says ’29 minutes’. But that time is not listed on any of the experiments. Is this time correct? (Sorry, doesn’t take much to confuse me! ?) Looking forward to trying steel cut oats in my IP! The total cooking time includes the get up to pressure time (7 minutes), pressure cooking time (10 minutes) and the release time (12 minutes). Thank you for the kind comment & rating the recipe Angela! Your instructions worked, thank you for a week of hearty breakfast​! We will put that in our recipe. It is better to use the pot in pot method for milk mixture as it may scorch the bottom of the pan. You will have to increase the cooking time by about 3 minutes. Do you think this would work with the ekovana stainless inserts? I would like to use them to minimize cleanup and to make them in a container that I can then store the leftovers in​ . Thanks! You can. Just make sure it is not filled more than half way full or the oatmeal may spill out. The cooking time will have to be increased by about 3 minutes as well. Thank you Amy. I am going to use this for breakfast tomorrow. 1) Is the 1/4 cup serving of steel cut oats dry or prepared? 2) Can the delay start be set for any thing other than whole hours? 3) Can this be done PIP? And how might it change the cooking time? 3) Yes, this can be done with Pot in Pot. I would say a few extra minutes with stainless steel pot. 13 – 15 minutes + Natural release. Jacky & Amy, Thank you for taking the time to answer my questions. One last clarifying question, can the PIP be ceramic (I have a 2 quart that is like a giant ramekin that fits nicely in my 6 qt. IP) and how would that affect cooking time?